Keep the pressure on your Senators. Call them TODAY and tell them to vote NO on H.R. 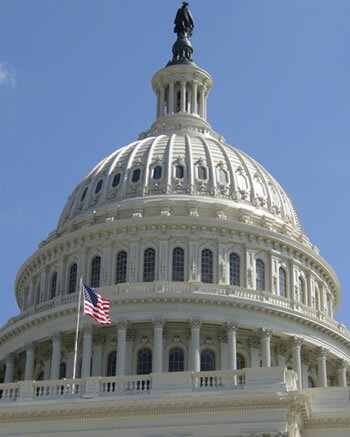 2, the Medicare Access and CHIP Reauthorization Act (MACRA). Click here for contact information for your Senators. Make no mistake: H.R. 2 bolsters ObamaCare’s control over patients and their physicians and empowers groups profiting from MOC. Your efforts are making a difference. Because you are speaking out, the establishment’s spin machine is running in overdrive to cover up the problems with this bill. The Texas Medical Association has even resorted to name-calling to silence critics of this bad bill, shaming “internet trolls” who are “spreading lies” about H.R. 2. SPIN: H.R. 2 was developed by Republicans, not in a secret deal between Boehner and Pelosi, thus it is good and should be passed. While fee-for-service is not outlawed by H.R. 2, the additional red tape imposed by the bill will increasingly drive independent physicians out of the profession entirely or into the employ of hospitals and insurers. It “furthers the push away from fee-for-service payment in favor of newer forms of managed care, such as the Accountable Care Organization. These, despite the bells and whistles, are doomed to fail,” writes AAPS President Richard Amerling. Texas physician Patrick Roughneen notes, “We will now be asking doctors in this country who provide Medicare services to undergo expensive and unrealistic documentation requirements in order to be paid. The only result will be a departure by physicians providing services to these needy patients.” Not to mention the bill preserves Medicare’s price controls which exacerbate shortages. “Portions of this program [MOC] will be used as a physician reporting measure,” notes Dr. Wes Fisher. 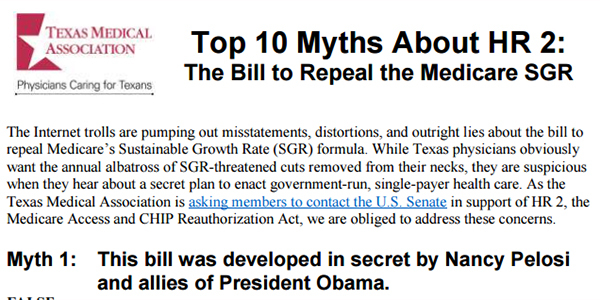 In fact, in 2013 ABMS explicitly lobbied Congress asking for MOC mandates to be included in SGR replacement legislation. “ABMS MOC® … should be foundational to any future system,” states an ABMS Senior Vice-President in a letter to the U.S. House Energy and Commerce Committee. SPIN: H.R. 2 is a fiscally responsible bill. SPIN: H.R. 2 reduces bureaucratic red tape for physicians. SPIN: The bill doesn’t require Medicare participation by physicians and removes the requirement that opted-out physicians renew their opt-out every 2 years. REALITY: We are not aware that anyone said H.R. 2 requires participation in Medicare. It just imperils the ability of beneficiaries to get coverage of services ordered by opted-out physicians. We’re all for ending the ridiculous re-opt out requirement. This can be done without H.R. 2. In addition, physicians and seniors must be allowed true freedom to escape the financially insolvent program. REALITY: The bill continues the freeze on physicians’ rates that began in the 1980s. It just adds a tiny amount to the frozen price. H.R. 2 “does away with the SGR, but enshrines Medicare price controls and an arbitrary update formula guaranteed to be substandard,” writes Dr. Richard Amerling. SPIN: H.R. 2 does not harm a patient’s right to medical privacy, nor does it require a physician to turn a patient’s medical record over to Medicare. REALITY: If patients’ records are entered into an interoperable data registry, without consent or ability to opt out, with access to any government-authorized entity, this is no different from turning records over to the government. SPIN: Don’t worry about requirement in H.R. 2 mandating an NPI for prescriptions to be paid for by Part D.
REALITY: The bill may give HHS the power to invalidate a physicians’ NPI, and some pharmacies are already refusing to fill prescriptions without an NPI even if the patient self pays. In addition, H.R. 2 strengthens CMS’ policy of demanding an NPI for all services ordered by physicians even if they are not the party receiving payment for the service. This puts in jeopardy the ability of beneficiaries to get coverage of services ordered by opted-out physicians. REALITY: For the reasons outlined above (and numerous reasons unstated) the bill is not only imperfect, but unacceptable.